Wackpacker Jeff The Drunk from the Howard Stern Show mentioned Howard Teman of T-Man Tattoos on his Periscope recently. It’s hilarious! Terri Hatcher and her daughter Emerson paid a visit to Howard Teman of T-Man Tattoo in Studio City, California to celebrate Emerson’s raising of $50,000 for the Children’s Hospital of Los Angeles! Read the full story on TMZ.com. Steven Adler popped into Howard Teman’s T-Man Tattoo Studio to purchase more original artwork by the artist himself. While he was there, he added new ink! 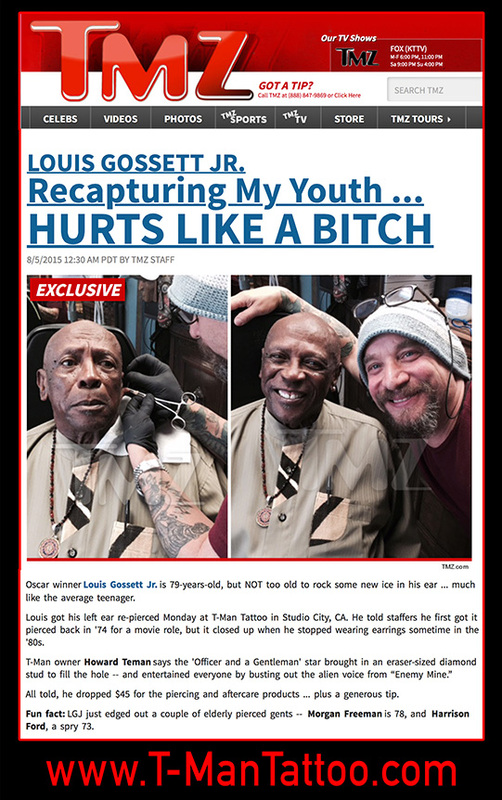 Louis Gossett Jr. of An Officer And A Gentleman fame, dropped by the T-Man Tattoo Studio to get his left ear pierced by owner Howard Teman. The eraser size diamond will be sure to draw attention to this beloved actor! Howard Teman of T-Man Tattoo Studio was featured in the May 2015 issue of Pain Magazine. Jump to Page 42-43 to read the story!